I make absolutely no claim to have seen the GFC coming. My colleagues in ANZ’s economics team and I had of course been well aware of the fragile state of the financial markets in both the US and Europe since mid 2007, when the connections between the US sub prime mortgage market and the European banking system first came to light. We had started to keep track of the growing mountain of write downs and losses incurred by investors in and issuers of complex derivatives based on mortgage backed securities, and of the widening spreads between official short term interest rates and the rates which banks were paying each other for short term loans. Beginning in March we began warning of a ‘global credit crunch’ that could in turn lead ‘possibly to a recession in the US and other large industrialised economies’. By August 2008, we were telling our clients that although the US ‘hasn’t experienced a recession yet, it probably will during the next 12 months’ and that ‘some other advanced economies will also fall into recession’. We were also telling ANZ’s senior executives, and our clients, that Australia was exposed to these forces because we had been financing our current account deficit, which by that stage was the world’s fourth largest (in absolute terms) largely through banks’ borrowings in overseas markets. But we absolutely did not foresee the series of calamities which struck the US and European financial systems in October 2008. And even though we quickly recognised that these made a global recession more or less inevitable, it took us some time to appreciate just how severe that recession would be. In particular, I was surprised at how quickly the seizing up of the US commercial paper market, the contraction in trade finance, and the global shortage of US dollars transmitted the crises in the American and European financial systems into an almost unprecedented downturn in global economic activity. And I remember being especially struck by a series of charts compiled by Barry Eichengreen and Kevin O’Rourke (two American academic economists whose work I had followed for many years) in the early months of 2009, showing eerie parallels between the trajectories of world stock markets, world trade and industrial production in the months following the onset of the global financial crisis and the period following the stock market crash of 1929. Prompted by that and other similar comparisons, like many other economists I found myself reaching into economic history, so as better to understand how badly things could potentially turn out – and also for some clues as to what might be done with a view to avoid repeating that history. It occurred to me then, as it still does, how fortunate it was that the person in charge of the US Federal Reserve, Ben Bernanke, knew more about the economic policy mistakes that had been made in the 1930s than anyone else on the planet. It’s in no small measure due to the lessons that Bernanke drew from his academic career studying the economic history of that period that those mistakes weren’t repeated. That’s not to say that the Fed, other central banks, and governments, didn’t make other mistakes. In particular, the fiscal stimulus programs implemented in the aftermath of the financial crisis were thrown into reverse too early, in both the US and Europe. In contrast to the substantial financial support provided to financial institutions, not enough was done (in the US, in particular) to support home buyers who were unable to refinance or restructure their mortgages, and workers who lost their jobs. The combination of ongoing loose monetary policy combined with fiscal austerity has exacerbated inequality in the US and Europe – which, together with stagnant real wages and the apparent absence of any serious consequences for those whose actions (or inactions) helped precipitate the financial crisis, has fuelled the emergence of both right and left wing populists and extremists on both sides of the Atlantic. Here in Australia we survived the financial crisis without experiencing a recession (at least by the most commonly used definition of that term). I thought then, and still do, that one of the reasons for that was that our central bank had been one of the few in the ‘western’ world not to have made the mistake of leaving interest rates too low for too long in the early 2000s – as a result of which, there had been rather less imprudent borrowing and lending than there had been in the US or Europe. That’s not to downplay the importance of the RBA’s and the Rudd Government’s actions in ensuring that the Australian financial system had access to sufficient liquidity; the sharp reductions in interest rates which the RBA undertook in the months after the Lehman’s collapse; the fiscal stimulus measures implemented by the Rudd Government (which I at the time dubbed the ‘Technical Recession Avoidance Plan’ or TRAP, a nod to Kevin Rudd’s love of acronyms and to the Troubled Assets Relief Program or TARP implemented by the Bush Administration to forestall the collapse of the US banking system); and the impact on Australia of the massive stimulus engineered by the Chinese government in the wake of the crisis. All of those played a role in minimising or ameliorating the damage that could have been inflicted on the Australian economy by the global financial crisis. Ten years on from one of the defining moments of the global financial crisis, there is unsurprisingly a good deal of soul searching around whether all of the lessons from this episode have been absorbed, and whether (and if so when) it (or something like it) might happen again. Can the GFC happen again? 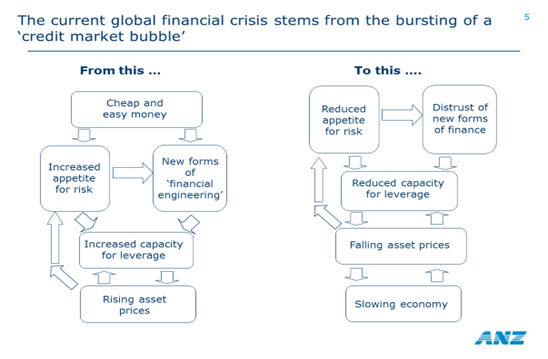 In my view, it’s almost inevitable that there will be another ‘crisis’ of some sort at some time in the future – but it probably won’t stem from where the last one did, not least because of all that has been done to reduce the extent of risk taking (and increase the amount of capital) in banking systems since then. It could well start in some other part of the financial markets; it could be brought on by an unexpectedly rapid increase in interest rates (especially given that financial markets continue to doubt the ‘guidance’ the Fed has repeatedly given regarding its intentions); it could be prompted by a sudden escalation in the ‘trade wars’ which the Trump Administration has launched against a number of its trading partners. What’s of greater concern, I think, is the diminished capacity – and in some cases willingness – of central banks and governments to respond to any future crisis as they did to the one of a decade ago. Central banks obviously don’t have the same capacity to cut interest rates as they did as the global financial crisis began to take hold. They probably have less scope to undertake ‘quantitative easing’ than they did ten years ago. It’s hard to imagine that the ‘America Firsters’ who are now in charge of US economic policy would allow the Federal Reserve to supply US dollars to other parts of the world as readily as it did in the aftermath of the collapse of Lehman Brothers. Given the increase in public debt over the past ten years, it seems unlikely that governments would have the same appetite for undertaking fiscal stimulus as they did, for at least a little while, a decade ago. By and large the same observations seem to hold true for Australia as well. Australia is in some ways more vulnerable to a financial crisis than we were when the last one hit, if only because of our much higher levels of household debt and our more stretched housing values. And our policy makers are clearly less well placed to respond to any crisis – whatever its provenance – than they were a decade ago, given that official interest rates are at record lows, and our public finances in much less sound condition than they were on the eve of the global financial crisis. But we may be fortunate that our ‘housing bubble’ seems to have peaked, and our borrowing binge drawn to a close, before interest rates have begun to rise and while unemployment is declining. We need to keep our fingers crossed.